Arson Squad, front, leads the way for I’m Charismatic. 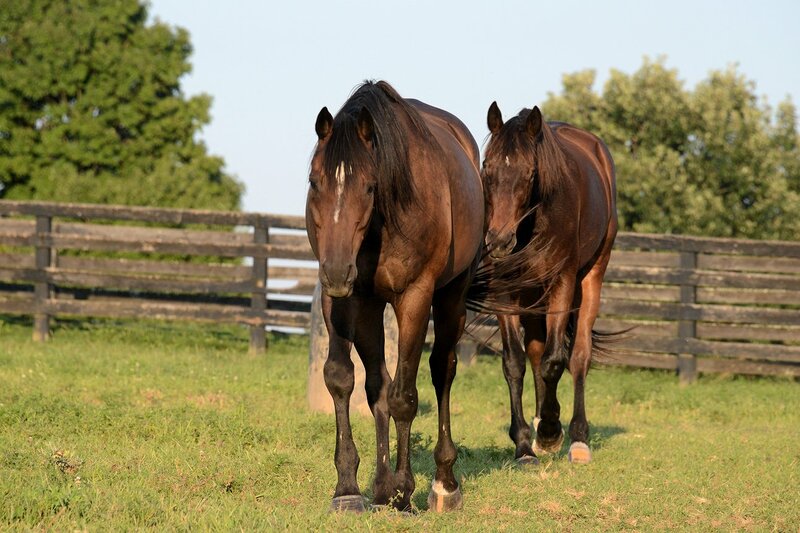 Continuing the theme of some of the best friends at Old Friends, another pair known to many of our supporters and visitors are Arson Squad and I’m Charismatic, whose bond has endured and strengthened through some life-changing developments. The two bay geldings could hardly have been more different on the track, Arson Squad a well-known millionaire multiple graded stakes winner, I’m Charismatic, though a son of Derby and Preakness winner Charismatic, a modest claimer who by the end of his career was struggling in the bottom-most ranks with an ankle issue that should have sidelined him long before a fan enabled his retirement. Arson Squad was as lucky as he was talented: his owner was Samantha Siegel of Jay Em Ess Stable. He was going strong when a workout-related accident cut his career short. Thanks to Samantha, Arson received the treatment for a comfortable retirement and normal pasture life, and a place at Old Friends. Both geldings having survived serious issues in the right front ankle, they were perfectly matched paddock mates. 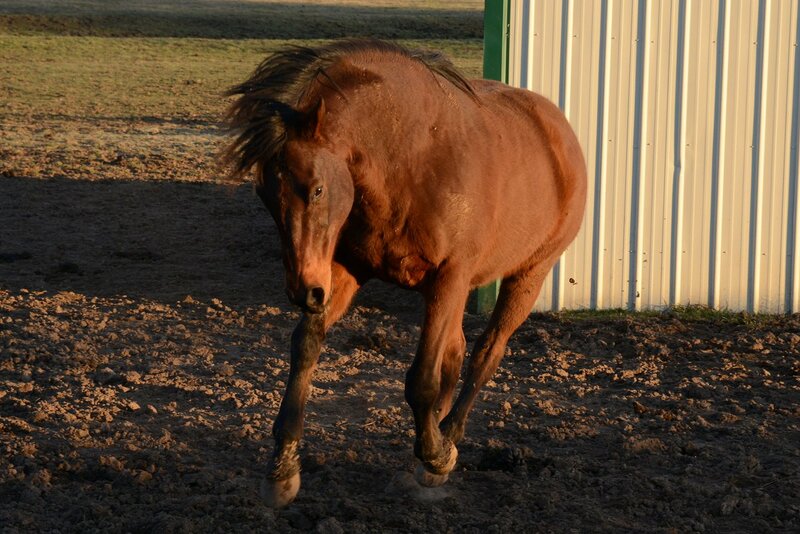 As younger horses do, they’d enjoy playing but neither would push the other beyond what he should do. And so it proved. They hit it off so well that when Arson Squad made a guest appearance one Saturday morning in the Keeneland paddock, I’m Charismatic trotted around and called for him until he returned that afternoon. Tougher times were in store for I’m Charismatic, though. He succumbed to an incurable infection that gradually blinded him. Though repeatedly tested and treated by our expert resident vets, the late Dr. Doug Byars, and Dr. Bryan Waldridge, both among the leading equine vets worldwide, I’m Charismatic’s sight could not be saved. He’s otherwise a healthy, active horse. He’s also smart and a great adapter to everything life has brought to him. I’m Charismatic already knew his paddock and paddock mate well. If we can help it we’ll never change his environment or his companion. 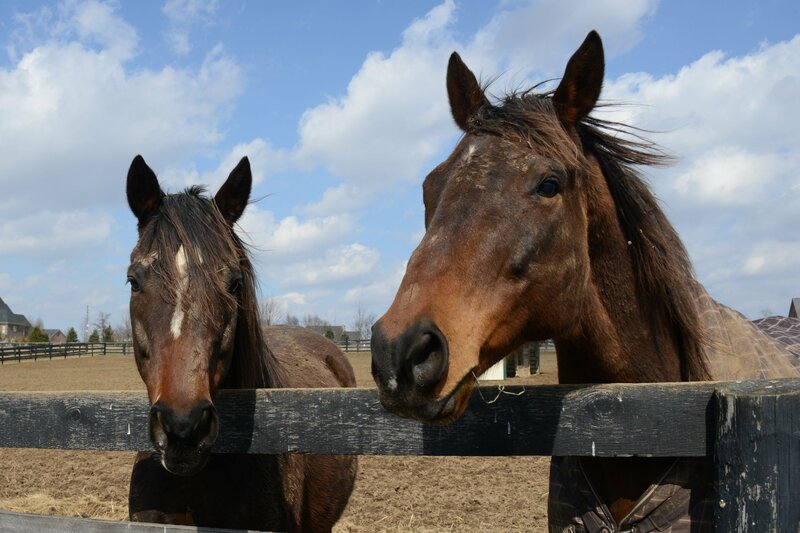 Left: Arson Squad, right: I’m Charismatic. Since then, Arson Squad has retrained himself for a new career. In many ways he has taken on the role of his buddy’s Seeing Eye horse. I’m Charismatic has learned new things, too. He was already an expert meeter and greeter on tours and still is. Formerly not much of a cuddler, he’s now learned to enjoy being rubbed and scratched, a new way to communicate with the people he can no longer see. More than that, when he was sighted the leader in that paddock was I’m Charismatic. In herds, even herds of two, horses always have a pecking order. Nowadays, the leader in that paddock is…you guessed it…I’m Charismatic. He may not walk in front, but horse leaders usually don’t anyway. He still tells Arson what to do. Arson, being the peaceful soul that he is, gracefully plays his supporting role and remains a patient and kind friend to his best buddy. 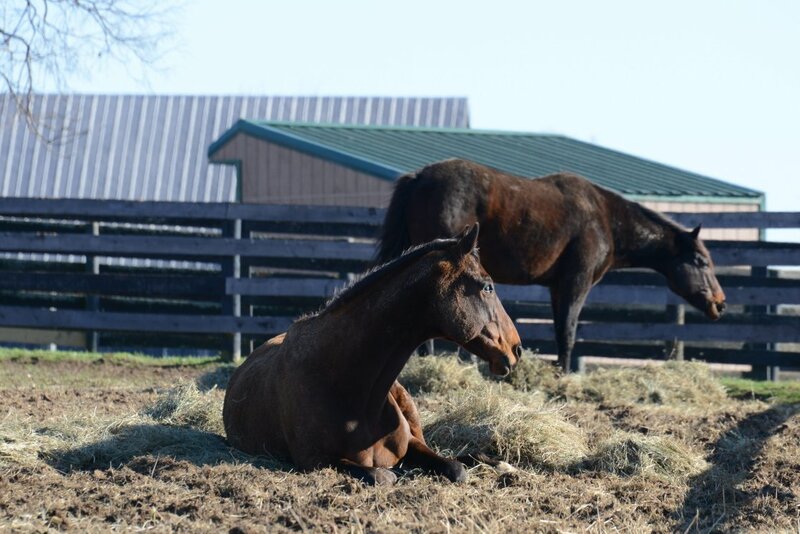 I’m Charismatic has a rest on the warm hay pile. Arson rarely goes far away. I was going to post about several other pairs, but this has turned into a long account, so coming soon will be Victor Cooley & El Brujo, Rapid Redux & Amazombie, our newest twosome Futural and Yankee Fourtune, plus an interesting triangle with Maybesomaybenot living up to his name. 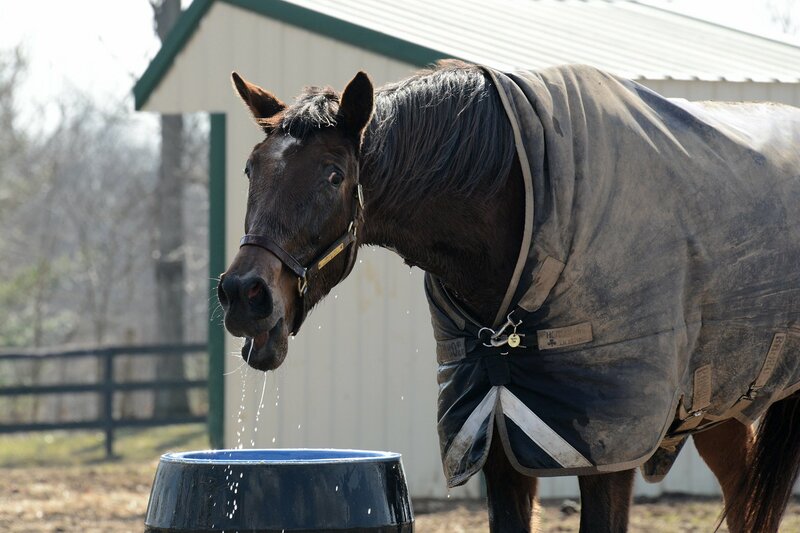 Swan’s Way, too, is enjoying the warmer weather and the larger numbers of visitors who are taking advantage of the milder temperatures to admire his hard-knocking past and relaxed retirement. 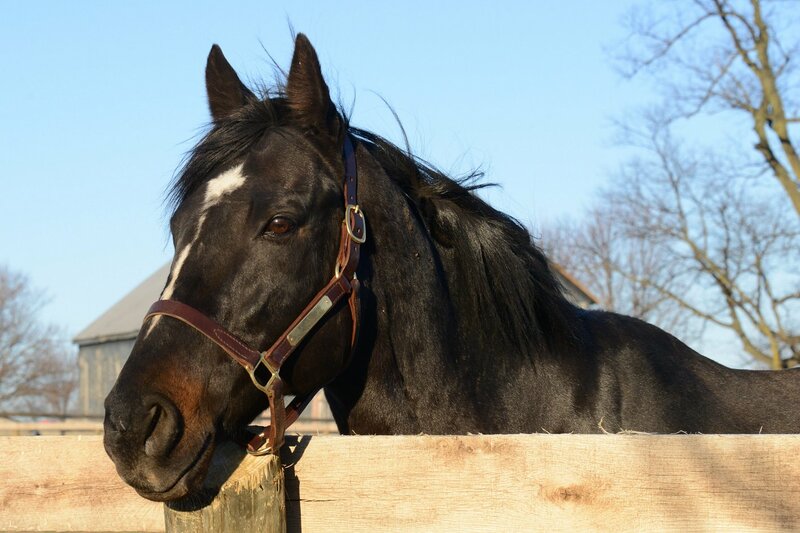 Swanny has been with us “since Hurstland.” That is, since Old Friends was located at Alfred Nuckols, Jr.’s’ beautiful Hurstland Farm in Midway. Old Friends’ main location moved to Georgetown in June 2006. After some beautiful early spring days – blop! – snow fell today. The ground is white and winter seems forever. To cheer away the wintery glums, I’m going to interrupt the theme of buddies to share some recent photos, most of them taken within the last few days, of some horses many have come to know and love over the years. How are Riva Way, Kudos, and other long-time favorites of many, doing? 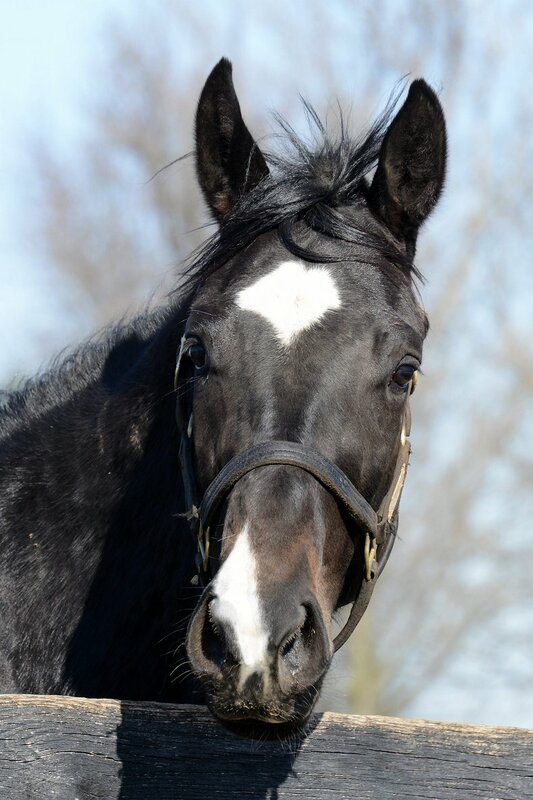 First, a few photos of a horse who’s new to Old Friends but who’s being reunited with many admirers since he came to live with us a few months ago, 2002 Kentucky Derby winner War Emblem. He’s 17 now, a ruggedly handsome, nearly black horse with an individualist attitude. 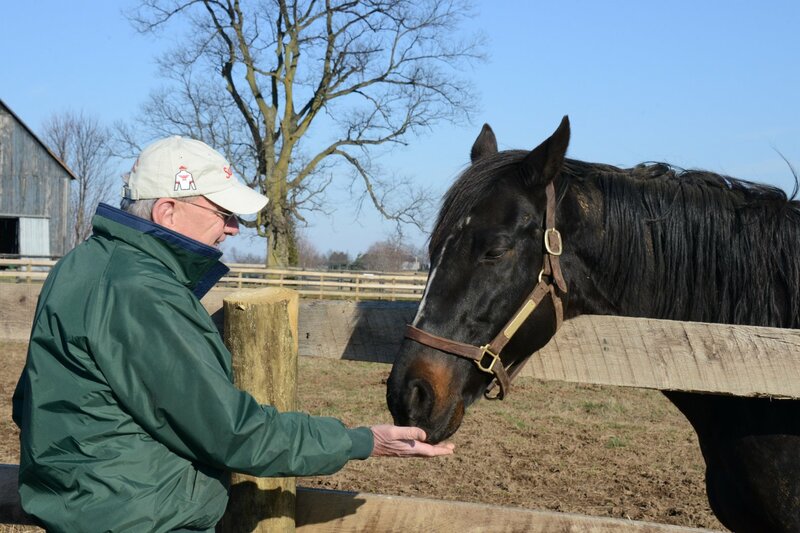 War Emblem and Michael – time for carrots! War Emblem has settled into his home and is getting to know us. He likes to be on top of everything that happens and keeps an eagle eye out on everything in his world. We’re under no illusions. In War Emblem’s world we exist to serve War Emblem. Well, did we win the Derby? Ahh, yes…how’s this for service? 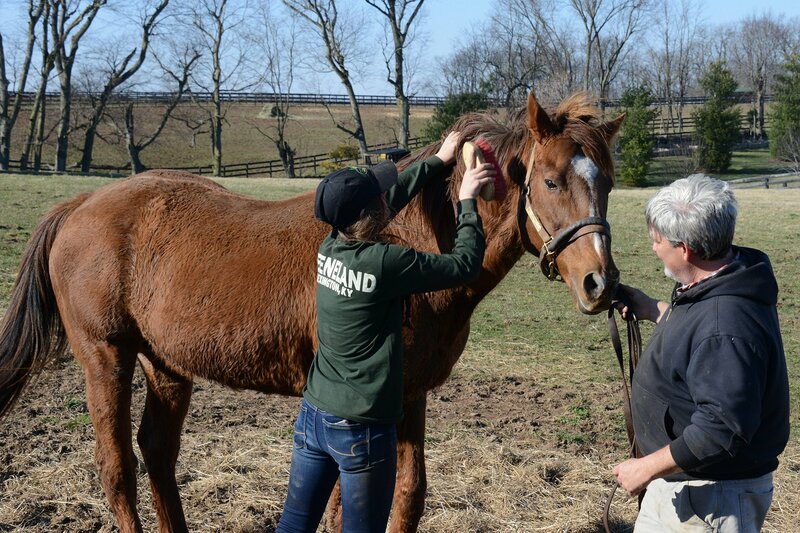 Tinner’s Way gets a nice grooming from volunteer Julie Witt. 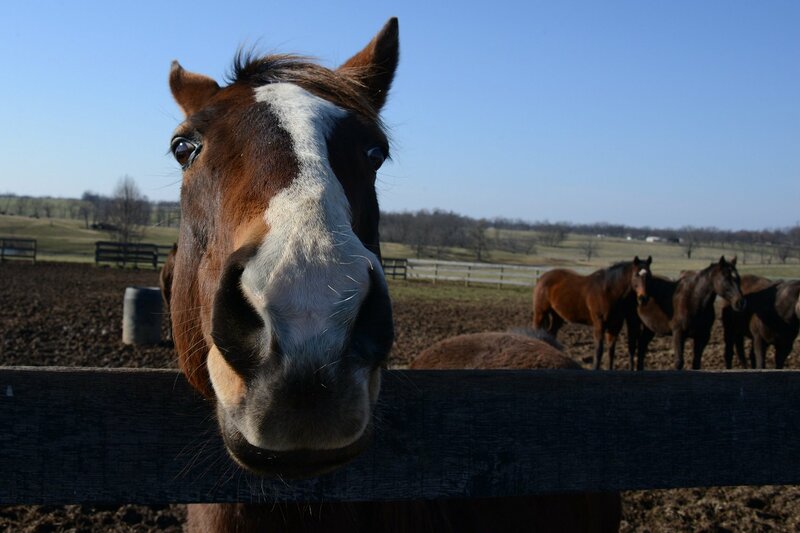 Besides her affiliation with Old Friends, Julie is part of the University of Kentucky’s Horse Racing Club, a student group who will be visiting Old Friends in April. 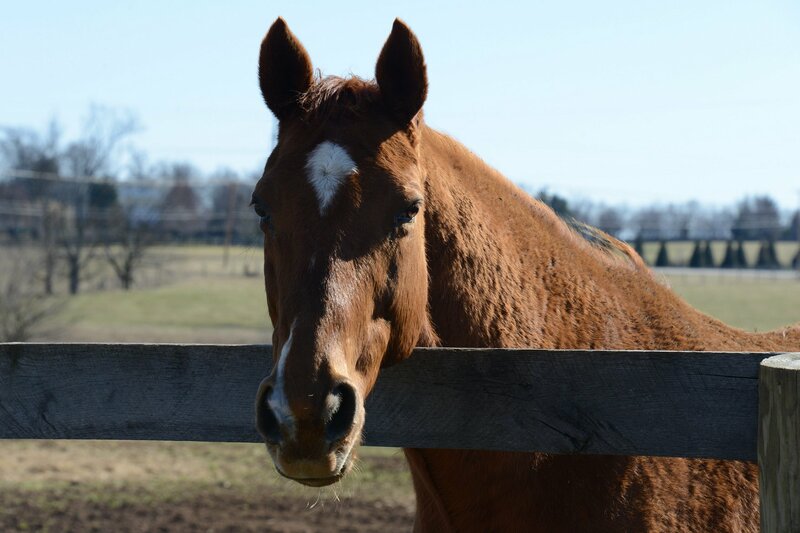 Over the years many visitors have gotten to know one of Affirmed’s best sons, $2 million plus winner and red hot miler from 1997 through 2003, Affirmed Success. He’s now 22 years old. 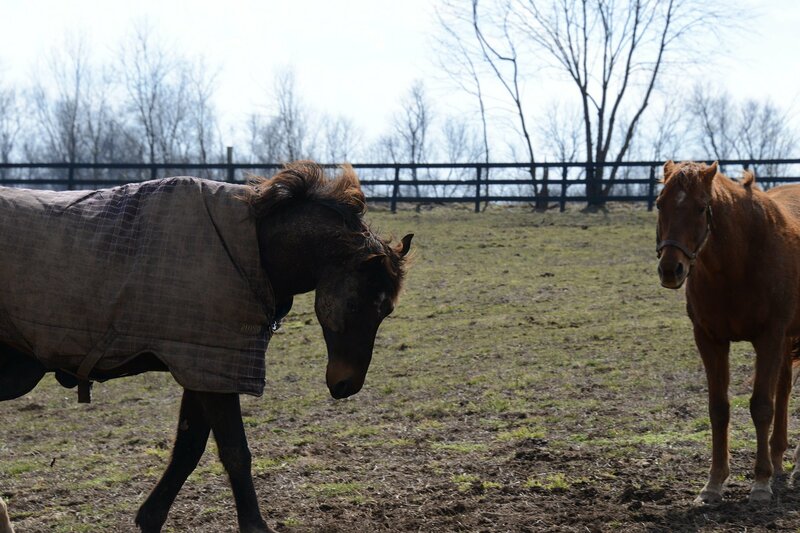 He, Kudos and Northern Stone share the paddock across the way from Tinner’s. As for Kudos, the G1 winner, donated by Jerry and Ann Moss in our early days, one of Old Friends’ “founding stars,” he’s doing great. He’s a social horse who finds good companionship whoever he’s with. He and Affirmed Success are great friends, and Northern Stone likes living with them, a smaller, less competitive circle where he gets to be a star, too. Speaking of really long time residents, here’s a photo Laura took a few days ago of Riva Way. As some may remember, Riva has lived with us far longer than his dad, Tinners Way. 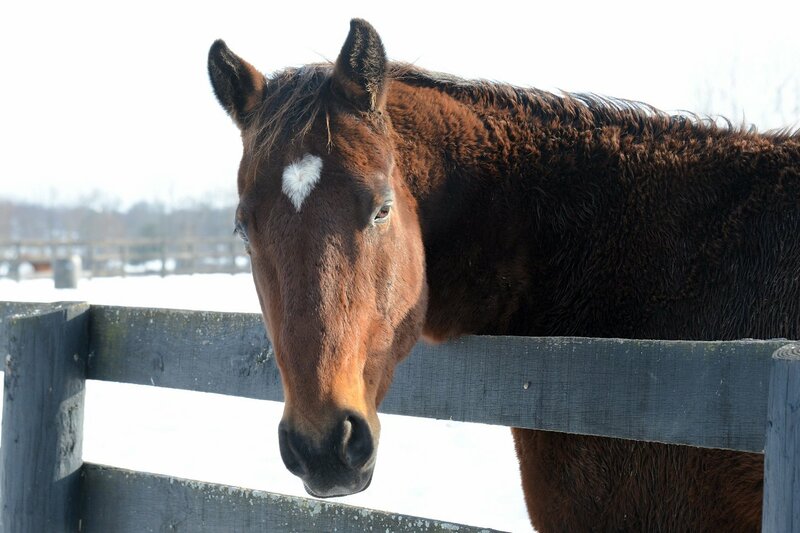 His grandpas are two Meadow Farm horses a few people might have heard of, Secretariat and Riva Ridge. Riva Way is now 18 years old. 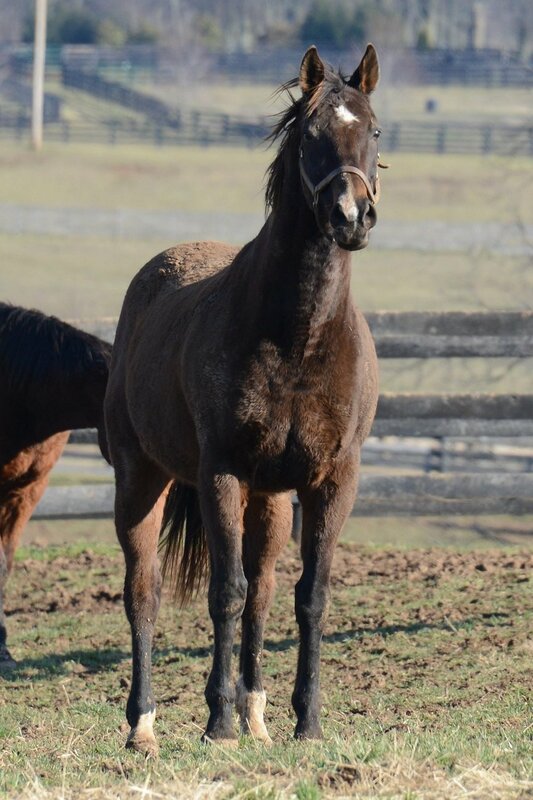 And speaking of the kin of Derby winners, some may remember when Falcon Scott, half brother to Giacomo, lived in the paddock that’s now Sarava’s. As you can see from the background, Falcon currently lives in one of our most spacious pastures among a thriving herd of youngish geldings like himself. As can be seen, he’s as kind, curious and attention-loving as ever. He seems to enjoy life with his gang of good buddies. Being herd animals, many horses feel the most secure that way. …Like these two. Once Fabulous Strike (L) and Commentator (R) held off all challengers to occupy the lonely glory of the winner’s circle. These two have been there, enjoyed that, and now appreciate just hanging out with each other and English-bred Marshall Rooster. 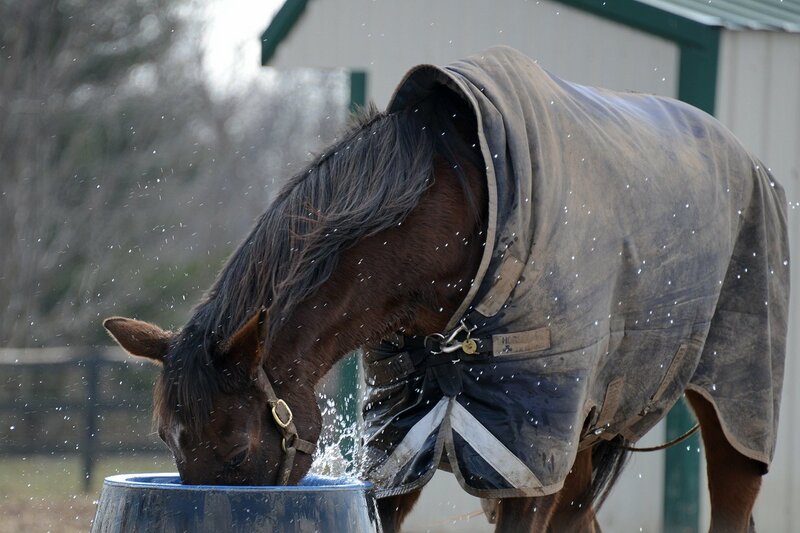 On the theme of enjoyment, Older Female Eclipse Award champion Hidden Lake was quite busy Saturday. While Ogygian’s grandson Cherono played on dry land. Finally, I’d like to introduce a new friend, Old Friends’ most recent arrival and youngest resident, Saint Aloysius. When three-year-old Saint Aloysius’ attempt at a career on the track didn’t work out due to a bowed tendon, his racing owner, New Orleans Saints owner Tom Benson, generously enabled his retirement to Old Friends. Welcome, you cute guy!